Yuliya Voytenko from Lund University (and a member of the GUST team) presented a poster at the IARU (International Alliance of Research Universities) Sustainability Science Congress. The event entitled "Global Challenges: Achieving Sustainability" was organised on 22-24 October 2014 in Copenhagen, Denmark. 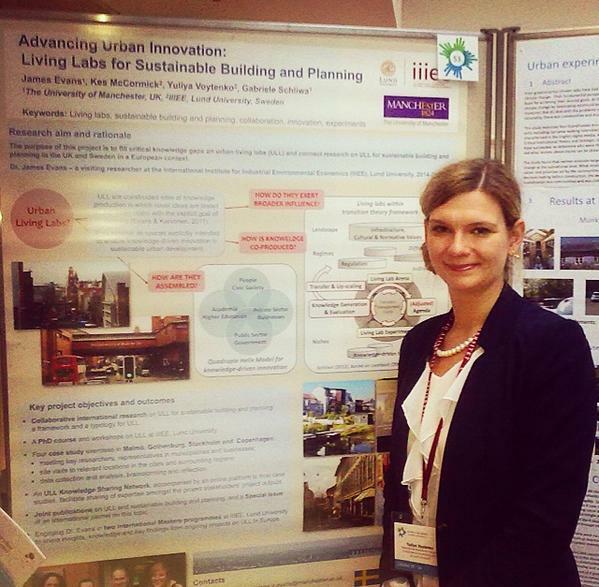 The poster was developed to present a project between Lund University and Manchester University called "Advancing Urban Innovation: Living Labs for Sustainable Building and Planning". The project supports James Evans as a Visiting Researcher at Lund University over 2014-2016. The picture below shows Yuliya presenting the poster.